Giuliani: GOP needs strong leader to focus party on president's "left-wing agenda"
(CNN) -- Republicans should focus on President Obama's "left-wing" policies and not get sidetracked by "false" issues such as the validity of his birth certificate, former New York Mayor Rudy Giuliani said on Wednesday. 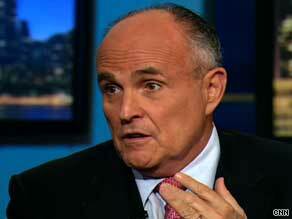 Rudy Giuliani says the economic stimulus package and certain health care plans threaten economic stability. Giuliani lamented the lack of a strong Republican leader who could direct the party's attention to what he called "the most left-wing agenda ... since Roosevelt." "We don't have a real leader of the party right now because we don't have a president, we don't have presidential candidates," Giuliani said. "So everybody gets to speak their minds." Giuliani, an unsuccessful candidate for the Republican presidential nomination in 2008, criticized Obama's domestic policies, including the economic stimulus package and proposed overhaul of the health care system, saying they expand government and threaten economic stability. "I think he has gone much further to the left than I thought he would," Giuliani said. He was less critical of Obama's foreign policy so far, agreeing with the increased military focus on Afghanistan and Obama's low-key approach to June's controversial Iranian presidential election and the subsequent demonstrations and government crackdown. "I think some of my Republican colleagues sort of instinctively criticized that," he said of the Iran situation. "I'm not sure I wouldn't have done the same thing and not get America, you know, deeply involved in that." Asked about questions by some conservatives about whether Obama is a U.S. citizen, Giuliani laughed and said, "We've got better things to do than that." "I've actually seen a birth certificate that kind of satisfies me that he was born in the United States," he said. "I don't get the issue. I don't know why they're pushing it as far as they are. ... To pick false issues like that hurts us more than it hurts the other side." Giuliani said one possible Republican leader is former Alaska Gov. Sarah Palin, who impressed him on the campaign trail last year. "I thought she was a really good governor. ... I thought she had done a really good job," he said. "There are a lot of questions because of all of the things that have been raised. She had the chance to answer them all. And I think she's a real presence in our party." Asked if he would run for president again, Giuliani didn't rule it out. "I don't know. We'll see," he said, adding, "We'll have to decide that some time at the end of this year."